There are many incredible sea kayaking opportunities in Humboldt and Del Norte Counties. The purpose of this post is to provide maps of a few of our favorite spots, primarily for those who might be visiting our area from faraway places. For a complete list and description of paddling opportunities and launch points along this incredible coast, check out Sea Kayaking the Redwood Coast, a sea kayaking paddle guide written by members of Explore North Coast. It can be purchased from our website at http://www.explorenorthcoast.net/. Crescent City has many great paddling opportunities. 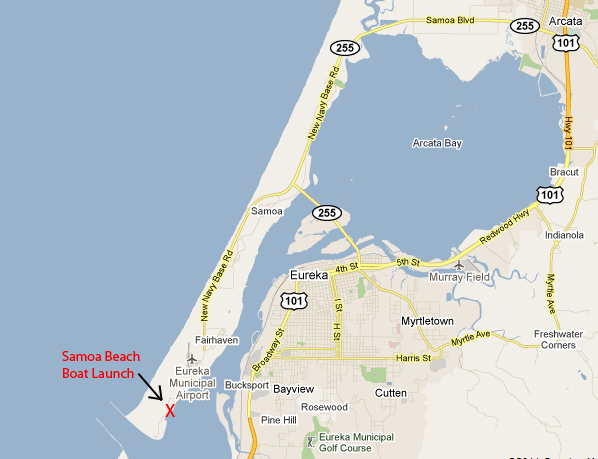 Our favorite launches are from Pebble Beach, just south of Pt. St. George, and South Beach and Whaler Island on the south side of town. This is a very exposed section of coastline that requires exceptional conditions to paddle safely. 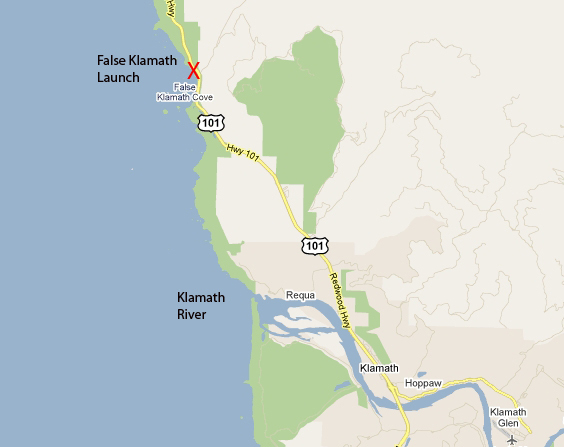 The launch point is from the NORTH end of the cove, about 6.3 miles north of the town of Klamath. There are a series of breathtaking coastal lagoons in Humboldt County. Our favorites are Big Lagoon and Stone Lagoon. At Big Lagoon, the launch is from the Big Lagoon County Park, located about seven miles north of Trinidad on the west side of Hwy. 101. Turn west onto Big Lagoon County Park Road and follow the signs to the day use area. Stone Lagoon is about six miles further north. 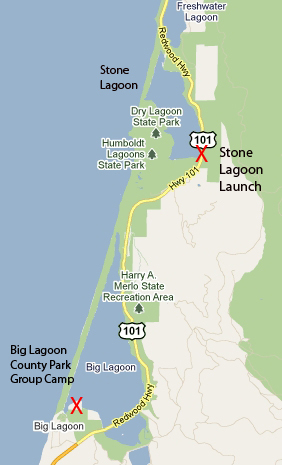 At Stone Lagoon, we generally launch from the Visitor Center at mile marker 108.5 on Hwy. 101. This paddle is one of the premier paddle locations along the north coast. 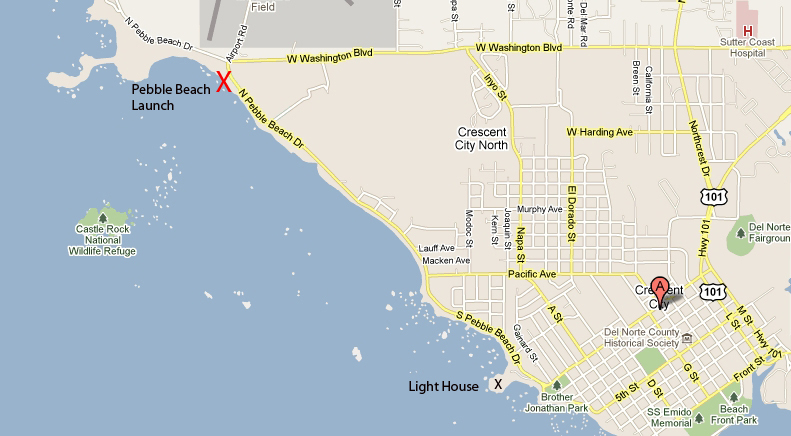 Launch points include State Beach, if conditions allow, or Indian Beach. 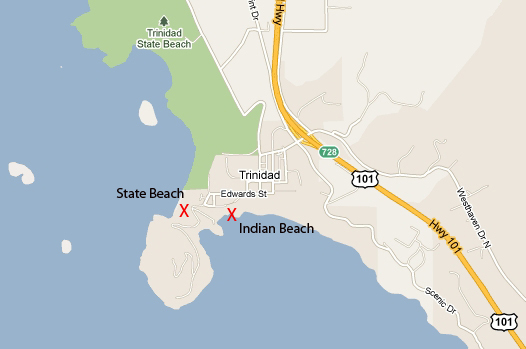 Take the Trinidad exit (exit 728) off Hwy. 101. Turn west. Follow the road past the Chevron station and market. Follow the road as it swings left at Trinidad Elementary School and then right at the Memorial lighthouse and down to Trinidad State Beach and the sandy parking lot. To the left is the paved lot for the Seascape Restaurant. 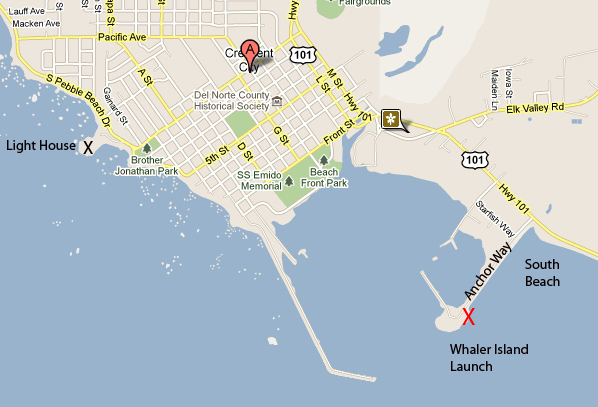 The Indian Beach launch site is at the far end of the paved lot. After unloading your boat and gear, please park your vehicle in the sandy parking lot by Trinidad State Beach so the parking for Seascape Restaurant customers is not impacted. Mad River Slough is part of the Humboldt Bay National Wildlife Refuge and a fascinating place to paddle. From Arcata and the Arcata/Samoa Blvd. exit (exit 713) from Hwy. 101, head west on Samoa Blvd. (Hwy. 255) for 3.7 miles. Cross over the Mad River Slough Bridge and park on the right side of the road. From Eureka, head west on Hwy. 255 across the Samoa Bride to the stop sign at Samoa Boulevard/New Navy Base Rd. Turn right and travel about 3.1 miles. Do not block the driveway of the lumber mill. A gravel ramp leads to the water. This paddle takes advantage of breaking waves that form by rip currents flowing across shallow sand bars in Humboldt Bay. Take Hwy. 101 as it passes through Eureka to Hwy. 255. Go west across the Samoa Bridge to the stop sign at Samoa Boulevard/New Navy Base Rd. 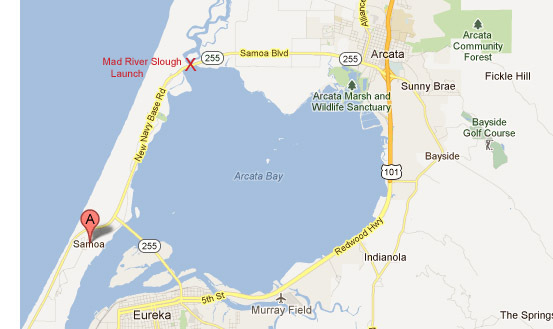 Turn left and proceed approximately five miles to Samoa Boat Ramp County Park on the left. If you’re planning to visit and paddle in our area, feel free to drop us a line through our club’s website. We spend a lot of time on the water and might be able to accompany you to some of our favorite areas. Read on to get a feel for some of the paddling opportunities.